The Passive House Planning Package (PHPP) is the building energy modelling software used to design a Passive House building. It is an essential part of the building design process. The PHPP allows users to create a complete building model to determine the energy performance of both the whole building and its individual elements. The impact of design changes is instantly displayed, enabling designers to efficiently rule out non-compliant designs and optimize the building performance. The PHPP has been thoroughly validated against measured performance data of real buildings in various climates, so you can be assured that the energy demand it predicts will reflect actual energy consumption. designPH 1.5 PRO is the last free major update for designPH 1 and gives an outlook on the direction of designPH 2. Existing customers can update for free at www.designph.org/patches_updates after login. New customers always get the latest version when purchasing designPH. We are currently working with the Passive House Institute to offer a French version of PHPP, which we hope will be available early 2018. We currently sell PHPP version 9.6, which includes software and a printed manual. If you have PHPP version 7 or 8, you can purchase version 9 at a discounted upgrade price. You will need to provide your PHPP registration number during the purchase process. If you need to purchase several copies of PHPP, multi-user licenses are available if you are purchasing 5, 10, 25 or more licenses. Please contact us by phone for more details. Please see the Software Update tab (above) to download the latest PHPP software updates. Note: orders are shipped from Victoria, B.C. within 7-15 business days from date of purchase. There is a no return policy on PHPP software, unless faulty. Complete the registration form on page 3 of your PHPP manual and email it to mail@passiv.de to receive software news and updates. The PHPP is sophisticated software that requires careful data input to ensure accurate results. It is highly recommended to enrol in the 3 day PHPP course to learn how to properly use the software. Experience has shown that individuals who have taken no or limited training (e.g. 1 day) struggle to correctly model buildings. For more detailed information on PHPP visit the Passivhaus Institute website. designPH is a plugin for the SketchUp software that supports PHPP building energy modelling. The latest version designPH 1.5 is compatible with PHPP 9. We currently sell designPH version 1.5, which is compatible with PHPP v9. Please have your PHPP software registration number handy, as you will need it during the order process. If you have designPH version 1.0, you can upgrade for a discounted price. Please see the Software Update tab (above) to download the latest designPH software updates. The Passive House Institute is continually developing the PHPP and designPH software. Find information about updates and instructions to make updates to your existing software here. You might have asked yourself already which reduction factor to enter for surface group 14 to temperature zone “X” in the worksheet Surfaces in PHPP. We have set up a short explanation to help you with this and added a small tool to easier estimate these factors in some cases, find it attached in English and German language. The Passive House Institute emailed an update of the component list to PHPP subscribers in North America in October 2017. PHPP subscribers are to include the update into the Component worksheet of their PHPP. Unlock the spreadsheet Components in your PHPP 9. Open the attached component update file and choose the worksheet in your language. In this worksheet, please copy the complete updated list of Certified Passive House Components by selecting the whole range of cells C115:MH514. Paste the cells into the Components worksheet of your PHPP 9 by clicking on cell C115 of the Components worksheet and then pasting the data stored in your clipboard. In line 115 you will find the status of the component lists above each component category. Remember to protect the spreadsheet Components when your finished. Subscribers can also update their IP-PHPP if they have version PHPP_V9.5_IP or higher. The component lists in the spreadsheet Components of IP-PHPP are converted from component lists of a worksheet called Components SI. Unhide this worksheet, unlock it and follow the instructions mentioned above for updating PHPP. By doing so, you will paste the metric component data into this worksheet. The updated component lists will then be linked to your Components worksheet in IP units and automatically converted there. Remember to hide the Components SI worksheet when you are finished. American market with an update of the so-called IP-PHPP (PHPP_9.7_IP). An new output file and additional EnerPHit criteria for the pre-certification of step-by-step retrofits. Linked to PHPP, this EnerPHit Retrofit Plan enables the user to present component qualities and efficiency results of single retrofit steps. Furthermore, a scheduler, additional descriptions and connection details complete the comprehensive presentation of the retrofit process. An Excel file creates a general summary of a step-by-step modernisation process that has been entered in the PHPP. A PDF file or printout for the building owner can be generated to provide a document to refer to at each step of the refurbishment. For more information see www.passivehouse.com. In PHPP_9.6a_EN, the limit for the primary energy demand will be dependent on the (nationally set) PE-factors for electricity. 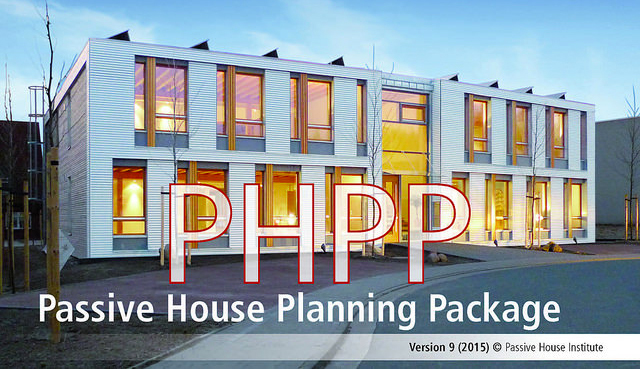 PHPP_9.6a_EN contains the recent lists of Certified Passive House Components and new climate data sets. We recommend that PHPP users working on Excel for Mac (2011 or higher) update their Excel-versions to the latest patch. The problems causing Excel-crashes when using the variant-macro seem to have been solved with this update, at least according to tests so far.